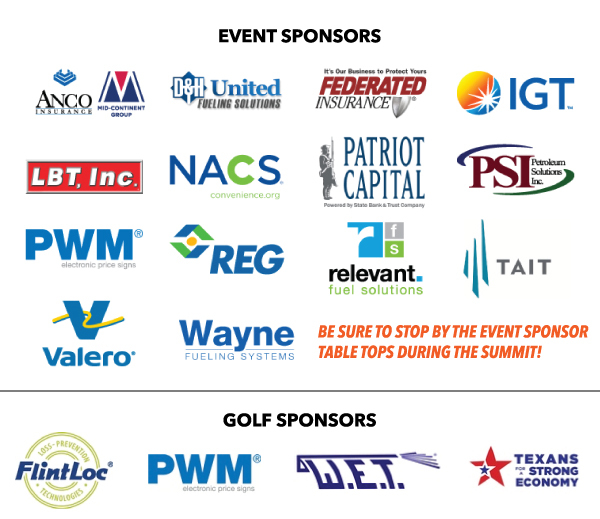 Connect with the participants, speakers, and sponsors below who will be at the 2018 Fuel & Convenience Summit. Kevin Prichard, A1 Pump, Inc.
Jeff Scarbrough, Allsup Petroleum, Inc.
Eddie Bates, C&I Oil Company, Inc.
Sherry Forbes, Circle K Stores, Inc.
Mark Wright, CITGO Petroleum Corp.
Keith Morgan, Coastal Transport Company, Inc.
John Seymour, Coastal Transport Company, Inc.
Jess Hines, Coastal Transport Company, Inc.
Joy Garcia, Connel Oil Corp.
Bobby Warren, Douglass Distributing Co.
Wes Potter, Douglass Distributing Co.
Don Grissom, Grissom & Thompson, L.L.P. Sean Mobley, GSC Enterprises, Inc.
Pete Bowles, GSC Enterprises, Inc.
Caleb Kaker, Hammonds Fuel Additives, Inc.
Amu Methani, Imu & Sons, Inc.
Rodney Fischer, Midtex Oil, L.P.
Jon R. New, New Distributing Co., Inc.
Mark Mullen, New Distributing Co., Inc.
Trey Budd, On-Site Fuels, Inc.
John Keller, Petroleum Solutions, Inc.
Wes Nance, Petroleum Solutions, Inc.
Alex Perez, Petroleum Solutions, Inc.
Luke Clements, Petroleum Solutions, Inc.
Bob Bissen, Petroleum Solutions, Inc.
Lance Bissen, Petroleum Solutions, Inc.
Larry Holybee, Petroleum Solutions, Inc.
Sarah Lawrence, Petroleum Solutions, Inc.
Jason Cortes, Petroleum Solutions, Inc.
Joe Bordages, PetroTex Fuels, Inc.
E. Harvey Steinhagen, PetroTex Fuels, Inc.
Brandon Von Quintus, PumpTex, Inc.
Terry Tesch, R.B. Stewart Petroleum Products Inc.
Dan Baker, Regal Oil, Inc.
Michelle Kucera, Retail Inventory Service, Inc.
Hank Kucera, Retail Inventory Service, Inc.
Michael Covey, Ryko Solutions, Inc.
Steve Boyd, Sun Coast Resources, Inc.
Andrew Tait, "Tait Environmental Services, Inc.
Bill Netherton Texas Enterprises, Inc.
Paul Pemberton, Texas Enterprises, Inc.
Richard Rogers, Texas TransEastern, Inc.
Rick Cantrell, Three L, Inc.
Kyle Allen, Timpson Quick Stop, Inc.
Alison Schmidt, U.S. Oil, a division of U.S. Venture, Inc.
Ginger Kelley, Victron Energy, Inc.
Patti Head, Victron Energy, Inc.
Aaron Nilsson, W.O.I. Petroleum, Inc.
Meredith Nilsson, W.O.I. Petroleum, Inc.
Tom Lye, Washing Equipment of Texas, Inc.